Survey Says: A number of enhancements—including user reviews and a much improved geo-location feature—have made Flixster’s Movies a better iPhone app. Wait a second—user reviews? Hey, that’s new. Indeed, developer Flixster has made a number of improvements large and small to Movies since I first reviewed the app in October. The latest version, which is optimized for the iPhone OS 3.0 update, is much more stable. The geo-location feature that gave me such fits last year works much better now, thanks. The app will let you enter a ZIP code or use GPS to find theaters near your location. Along with the user reviews, you can also browse films by their Rotten Tomatoes ranking (which sometimes varies widely from Flixster ratings—Transformers 2 didn’t fare nearly as well). The app also features photo galleries for most of the films, from which you can pick and save images and use as wallpaper. Many Facebook users may already be familiar with the Flixster application, which lets users rate and share their favorite films with their circle of friends. The iPhone app has a very powerful social networking component incorporating Facebook Connect, letting you review and add to your list of favorites from your handheld. Once you log in with your Facebook account, you can rate movies, mark films you want to see, and share ratings with your friends. You can also see your friends’ ratings, either from their Facebook pages or from the Movies app. As before, Movies provides the latest information on box office winners and losers, new DVD releases, and upcoming theatrical releases. The app links to thousands of movie trailers (you need a 3G, EDGE or functional Wi-Fi connection to watch the videos, which users can view in high-quality or optimized for the fastest loading times). You can also search by film title, actor and director. Movies is noticeably better now at enabling users to buy tickets online. I didn’t like the way the earlier version took me out of the app and into Movietickets.com, which had the worst interface on Earth. The new version is much easier to read and navigate, and you are no longer taken out of the app. But it can still be a chore to buy tickets. Users would do well to set up a Movietickets.com account and have a credit card stored for more convenient purchasing. The Flixster app compares very well with Cyrus Najmabadi’s Now Playing ( ) and Fandango’s mobile app ( ). Some users, in fact, have noted strong similarities between Now Playing (formerly Box Office) and Movies. Now Playing has a somewhat cleaner interface and also boasts Netflix support, but lacks Movies’ strong social-networking component. Flixster’s Jeff Grossman says Netflix support will most likely appear in Movies 3.0, along with some other nifty features, such as iTunes Store integration and—hallelujah!—a vastly improved ticket purchasing feature. Best Face Forward? : Mangled and poorly spaced type—note how the title of Sacha Baron Cohen’s latest opus appears—make for a weak interface for Movies & Theaters. 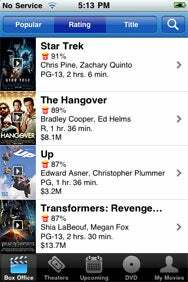 Another app that does not compare nearly as well is Movies & Theaters from Dworld Services. The app downloads movie information just once per week, making for painful load times when you launch the app for the first time—and, indeed, most of the time. The idea is to let users use the app without an Internet connection, but the execution is haphazard at best. The purpose of Movies & Theaters is summed up in the app’s name: It gives you movies and theater showtimes. But chief among the app’s drawbacks is the inability to actually purchase tickets online. The app does offer listings of current and forthcoming films, along with brief descriptions and links to theatrical trailers. Each listing has an average rating from critics and users, but it isn’t at all clear what “users” the app is sampling. There is no social networking component and no way for users to add ratings of their own. Finally, the app’s interface isn’t very good. Type often appears mangled and the spacing is poor. Users would be better off going with Flixster’s Movies. The app’s improvements make it a far more useful and convenient tool for figuring out the best way to spend your hard-earned bucks on the latest blockbuster. 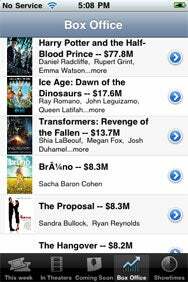 Movies is compatible with any iPhone or iPod touch running the iPhone 2.2 software update. Movies & Theaters requires iPhone 2.2.1.